British navigation technology “eLoran” is under examination of US military to thwart GPS jamming, it is under evaluation as complementary system to the GPS. Congressman John Garamendi introduced a bill that would require the U.S. Secretary of Defense to establish a backup for GPS within three years using a new type of navigation technology pioneered by the UK known as eLoran. This backup system could reach places that GPS currently cannot and prevent serious disruption caused by a prolonged failure of the GPS system. 16-days continuous GPS disruption of South Korea in 2012 could be taken as an example. “We are increasingly reliant on the precision, navigation, and timing services that GPS provides. From land navigation on cell phones to a timing source for our national infrastructure, we need a reliable backup system to GPS.” Garamendi said. “The National Positioning, Navigation, and Timing Resilience and Security Act of 2015 is a bipartisan bill that would establish a system to backup GPS, making our nation’s geopositioning infrastructure more resilient to threats both natural and nefarious” he added. On May 22, 2015 it was announced that a cooperative research and development agreement (CRADA) for evaluation of eLoran as a potential complementary system to the GPS was formed by Exelis, UrsaNav, the Department of Homeland Security’s Science and Technology Directorate (DHS S&T), and the U.S. Coast Guard. Global Positioning System (GPS) is the most widely-used positioning technology in today’s world with a vast array of military, civil and commercial applications. The technology is widely acknowledged to be vulnerable to both deliberate and accidental jamming attacks. GPS signals are relatively weak and consequently such signals can be easily corrupted, degraded, or denied access to. It’s believed that wide availability of GPS jammers online for as little as £30 and the disruption of GPS signals caused by jamming or other cyber security threats would cause serious national security, intelligence, and economic disruption for all countries. Therefore, a reliable backup system for GPS has been considered necessary for preventing glaring economic and security threats. Enhanced long-range navigation system (LORAN), or eLORAN, as a reliable backup for GPS signals is an internationally-standardized positioning, navigation, and timing (PNT) service for various applications. It is the latest proven series of LOng-RAnge Navigation (LORAN) systems and takes full advantage of 21st century technology. A million times stronger signals and much closer distance of the beacons to the receiver are the reasons for making eLoran more resistant to GPS jamming. Based on published news, in some cases criminals managed to steal ships transporting valuable goods simply by jamming mobile and GPS signals. As a result of this disruption, the victims remained clueless about their location and unable to ask for help. Since 2010 and for three continuous years, South Korea repeatedly faced GPS signals jamming caused by North Korea. 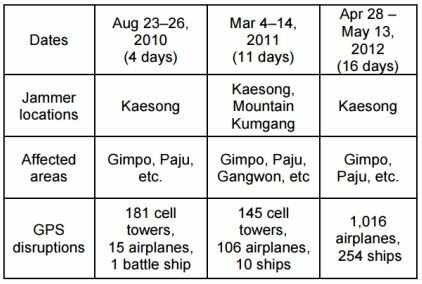 As the Table shows, it was reported that 1,016 airplanes and 254 ships in South Korea experienced GPS disruptions during the 16 days’ North Korean jamming in 2012. Due to problems caused by its northern neighbor, South Korea is moving ahead to implement a national enhanced Loran (eLoran) system to provide PNT services in the shortest time possible. Some countries around the world have prepared themselves to use eLoran. For example, The UK is the first in the world to deploy this technology for shipping passenger and cargo services to ensure that ships equipped with eLoran receivers can navigate safely in the event of GPS failure in one of the busiest shipping regions in the world. It’s anticipated that the bill becomes a law and eLoran as a backup for GPS signals could prevent serious national security, intelligence, and economic problems for all countries.